The powerful earthquake that rocked the Tohoku region Tuesday morning temporarily stopped the critical cooling system for a spent fuel pool at the Fukushima No. 2 nuclear plant for about 100 minutes, Tokyo Electric Power Company Holdings Inc. said. The cooling system was automatically shut down at 6:10 a.m. at the pool for the No. 3 reactor after sensors detected changes in the water level of a tank that pumps cooling water into the pool, which is home to 2,360 still-hot spent fuel assemblies and 184 unused ones. Tepco spokesman Kenichi Nakakuki said the quake likely shook up the water inside the tank, triggering the automatic shutoff. After confirming that no water had leaked from the tank, Tepco reactivated the cooling system at 7:47 a.m., Nakakuki said by telephone. No radioactive materials have been leaked from Fukushima No. 2, Tepco said. The station is located 12 km south of the heavily damaged Fukushima No. 1 facility. Lets wait and detect because you should not believe TEPCO nor ABEs government. ... "Between 1980 and about 2010 there were one to two earthquakes per year in the entire state. Between 2010 and 2015 that rate of seismicity changed to up to 15 small earthquakes per year," says Peter Hennings, a veteran of the petroleum industry and now a co-principal investigator at the Center for Integrated Seismicity Research (CISR), an earthquake research center managed by the bureau. The number of earthquakes continues to rise, with 28 earthquakes recorded in Texas in 2016. "Everybody wants to know what is going on. What has changed? Oil and gas have been important parts of Texas history for over a century, and connections have been proposed between earthquakes and drilling since the 1920s. But, says Tinker, "Just because we're doing something here and an earthquake happens nearby at the same time doesn't mean that caused that necessarily; but it could have. If human activity is causing the earthquakes, we need to figure out how to stop that." Earthquakes are typically measured using the Richter scale, named after the geologist who invented it in the 1930s. The scale is numbered from 0-10, although no magnitude 10 earthquake has ever been observed, making a 9.0 one of the most powerful quakes in recorded history. The predicted earthquake, dubbed the “Really Big One,” will take place where the Juan de Fuca and North American plates meet along Cascadia subduction zone, just north of the San Andreas fault line. The earthquake would affect those living in coastal Washington, Oregon, British Columbia and Northern California, and a 2015 New Yorker article predicted the quake and its subsequent tsunami could affect 7 million people. I am ashamed to say the near complete ignoring of this event last Friday by the American press left me quite shocked when someone happened to mention it yesterday and I looked it up. The parochial obsession of the US media with its near obsessive focus on politics means more and more events are left out of reporting unless you swing through foreign media sources, which I have been too distracted to do the last few weeks as life happens. Link below quote. PASANGKAYU, Indonesia — The earthquake shook their home so violently that Iffa Elia’s mother and younger sister fell to the floor and had to crawl out the door to relative safety. Fearful of everything from aftershocks to looting, they knew they had to get out. But when they arrived at the airport in Palu, one of the two worst-hit cities, they found total chaos. Hundreds of people were pressed against a fence surrounding the runway, screaming to authorities to get them on a plane out of the city. Desperate families tried to hoist children over the metal fence, which eventually gave way. “They were shouting ‘women only, women only,’ ” 24-year-old Elia, from the Palu neighborhood of Birobuli Utara, told The Washington Post. Her mother, unwilling to leave her father, decided to stay in the battered city along with her younger sister — and so Elia had to go it alone. She gave her name to an Air Force official standing amid the crowd, waving her identity card at him. After several hours, she was called, and she stood in line for what she believed was her chance to get out — but two Air Force officials got into a heated argument, she said, and dispersed the line. “It was just messed up again, and we had to start all over again,” she said. Three C-130 military transport planes came and went. After seven hours of waiting, Elia finally found a spot on a commercial plane that was being used to deliver supplies, and left to Jakarta — among the lucky few who did. She is among the many here who believe the government has failed on a multitude of levels: by providing little warning of the impending disasters, particularly the tsunami, then being too slow and disorganized in mobilizing aid and, crucially, failing to keep order afterward. More than 1,230 people have been confirmed dead in twin disasters, a 7.5-magnitude earthquake and tsunami, in Palu in the Donggala region and the surrounding settlements on the Indonesian island of Sulawesi. Over 61,000 have fled their destroyed homes in 100 neighborhoods and are growing more desperate — setting up makeshift tents, eating fruit from the few trees that still stand and scouring for water — as aid remains scarce. People are desperate to leave, swarming onto the runway at Palu’s airport on Monday, making it difficult for aircraft to land and hugging the wheels when they try to take off. Widespread fuel shortages have been reported by multiple aid agencies operating across the region as far south as Mamuju, still a nine-hour drive from Palu. Cars there were parked at gas stations, left stationary by dry pumps, and others were seen brimming with belongings heading away from the disaster area. On the road to Palu, humanitarian organizations were stopping to rearrange their vehicles in an effort to keep water and fuel hidden, amid reports of robberies on the road. Fuel trucks have been traveling to the region only after nightfall to prevent being seen and mobbed, and are guarded by police convoys. The death toll is likely to rise even further, as victims who have been buried by mud in a nightmarish process called liquefaction — where sand and silt take on the characteristics of liquid — have not fully been tallied. “We don’t know how many people have been buried in the mud because of liquefaction and land sinking,” said Sutopo Purwo Nugroho, spokesman for Indonesia’s National Disaster Mitigation Agency. Rescue workers have just begun to reach the region of Donggala, where some 300,000 people live. The area is still hard to access because of badly damaged roads, and rescuers doing damage assessments say everything on the coast has been damaged and destroyed. On Tuesday, local television broadcasts showed angry residents screaming at Indonesia’s president, Joko Widodo, better known as Jokowi, to ask for help. Nugroho, the disaster agency spokesman, admitted that “not all the needs” of those displaced are well served. “Everything is still limited — logistics, fuel, tents, mattresses, blankets, clean water, clothing and so on,” he said. Questions are swirling, particularly among the people of Sulawesi, about their government’s disaster preparedness and ability to respond quickly to crises. Indonesia is in the Ring of Fire, an arc of fault lines and volcanoes in the Pacific Ocean. The country has been rocked by earthquakes in recent months, including a major one and strong aftershocks on the island of Lombok that killed almost 600 in August. On Sunday, the Indonesian president authorized foreign aid, but none had arrived by Tuesday to the region. Over 18 countries have pledged aid and support, including the United States. Teams from the U.S. Agency for International Development are in Sulawesi conducting assessments, and the United States has authorized $100,000 in initial disaster aid through USAID. Indonesia’s coordinating minister for security affairs, Gen. Wiranto, said the government has asked, in particular, for additional C-130 aircraft that can transport evacuees and aid. Two countries, Singapore and the United States, are readying their military aircraft, he said. Witnesses say that more military convoys have been moving into Palu to deal with looters and stabilize the security situation. A 7.0 magnitude earthquake just struck outside of Anchorage, Alaska. Gaia is angry at Plant for polluting the skies with CO2 from all that flying. Repent, Plant. Repent. It occurs to me that many think earth quakes cause tsunamis. They are confusing cause and effect. What causes SOME earth quakes can also cause a tsunamis. And no: not all tsunamis have to be caused by the same event that produces an earth quake. So what are the two most common causes of a tsunami? The big damage is down around Anchorage about 400 miles south of where I live. 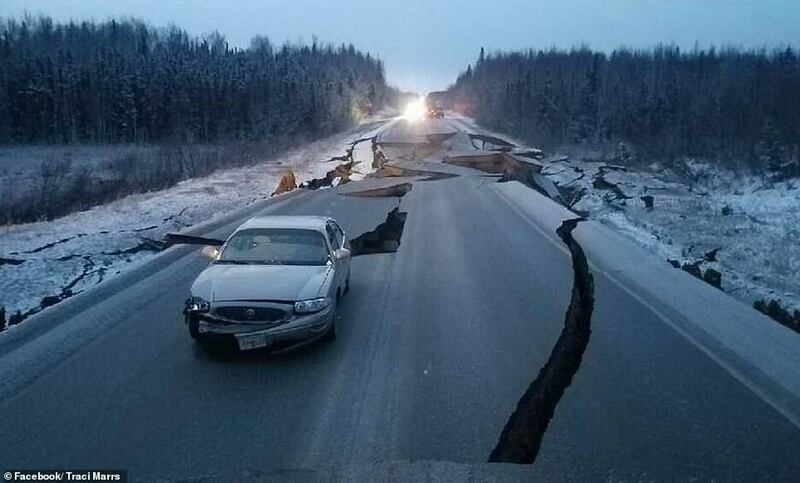 We had about 30 seconds of bumping and shaking up here in interior Alaska. It was nothing like the huge magnitude 8 earthquake on the Denali Fault Alaska had about 10 years ago, but we got some pretty good shaking this time. ROCKMAN wrote: It occurs to me that many think earth quakes cause tsunamis. They are confusing cause and effect. What causes SOME earth quakes can also cause a tsunamis. And no: not all tsunamis have to be caused by the same event that produces an earth quake. #1 a large underwater land slide as demonstrated by geological evidence around the Hawaiian Island and Canary islands. Every dated large underwater land slide in both locations can be linked to a corresponding Tsunami. #2 a large subsea earthquake that displaces a large profile of land on the sea floor and physically displaces a large volume of water in the sea directly above the land displacement. This effect is mostly observed when plate boundaries become 'stuck' for a period and then 'slip' rapidly into a new configuration altering the sea floor landscape. This effect has been demonstrated in the Indonesian Earthquake of 2004 and geological evidence supports that the same thing took place off the coast of Oregon, Washington and British Columbia around 1700 AD when a similar tsunami struck both North America and Japan at the same time the fault last slipped. The big fear now is when the Pacific and North American plates next slip it will set off the same effect again inundating both Portland Oregon through Prince Rupert B.C. and the east coast of Japan and Sakhalin islands. Glad you're safe Plant. I heard Alaska and I was like I know somebody that lives there! I went through a 7.0 when I was about 10 years old in the Bay Area of California.